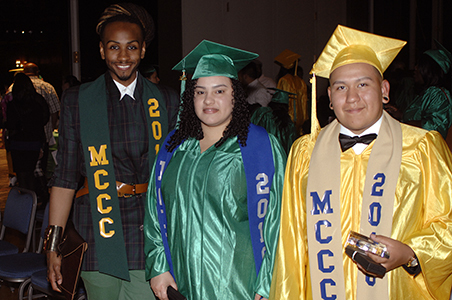 Trenton, N.J. – In its annual salute to graduates, Mercer County Community College’s (MCCC’s) James Kerney Campus (JKC) packed the Washington Ballroom at the Trenton War Memorial with close to 200 students and their family members for JKC’s 28th Celebration of Academic Achievement. Held May 3, the event recognized the completion of a program of study for students who have made the college’s Trenton campus their home base for learning. Among the 183 students recognized were 75 associate degree students, 24 High School Equivalency (HSE) students, 22 English Language Institute (ELI) students, 14 Career Training Institute (CTI) students, 12 students from Home Front, and 36 students who participated in New Jersey Youth Corps. Weaver emphasized JKC’s continued impact in the Trenton community. Annually, the campus serves over 3,000 students, along with approximately 1,500 teens through Youth College programs. “We are doing good things for the city and its residents,” she said, adding that programs recently introduced in Trenton include Fashion/Apparel Design, Fashion Merchandising, Security Systems Technology and Cybersecurity. Communication faculty member Alvyn Haywood served as master of ceremonies. Also joining in the celebration were MCCC administrators, faculty members, trustees, Foundation Board members, and city officials. 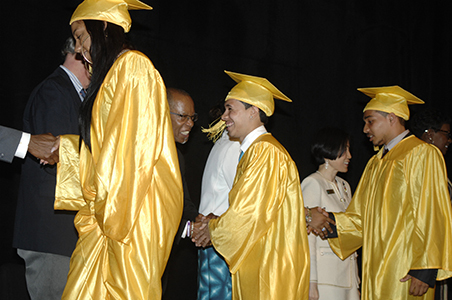 MCCC’s President, Dr. Jianping Wang, presided over her first JKC graduation event. “I want to congratulate all of you. But tonight is just the beginning. Your bright future is ahead of you. You can make it and Mercer will be with you all the way,” Dr. Wang said. Keynote speaker for the event was Dr. Susan Powell, of The Lincoln University of Pennsylvania, who offered strong words of encouragement. “Dream big, stay hopeful and believe in yourself,” she said amid applause and cheers. She also advised students to do some soul-searching. “Reflect on the skills you have developed, and know what makes you stand out and what you have to offer.” She encouraged students to excel, but to always remember to help others. 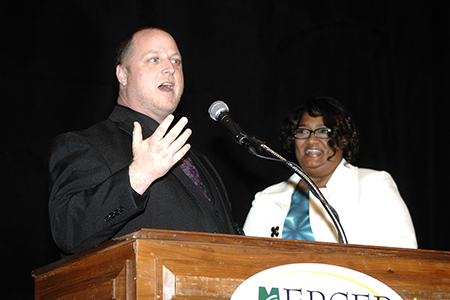 Provost Weaver reserved a special portion of the program to recognize staff members who “dedicate themselves to our students and their success.” Edward Mooney, a new member of the financial aid staff, was presented with the Rookie of the Year Award. The Excellence in Teaching Award was presented to Melissa Santiago, while Wayne Murray earned the Dedicated Service Award for 25 years with JKC’s Youth College programs. A special award this year went to student Kevin Williams, who went “Above and Beyond” at the campus’s Center City Café. The focus then turned 100 percent to the grads themselves, with each group represented by a selected speaker. Qayshawn Williams, who will earn his associate degree in Fashion Merchandising, pointed to three things that have made the difference for him: faith, dedication, and perseverance. "There were hurdles that could have derailed me, but in the end, you have to learn how to jump over hurdles to be successful," Williams said. Other speakers included Nick Castro, who completed his Culinary certificate through the Career Training Institute and Bobbie Wallace, who represented the High School Equivalency students. Omayra Vargas spoke for students in the English Language Institute, recalling that she knew almost no English just eight months ago and has come so far. She plans to continue her education at MCCC for a career in nursing. The final speaker was Eddy Saravia, who spoke passionately about his experience in Youth Corps, which includes community service and a high school diploma for students 16 to 25. “The Youth Corps program is about far more than service and academics," Savaria said. "It has provided me with opportunities and made me a stronger person." Provost Weaver concluded the ceremony by encouraging students to continue to grow as students and as people. “Education is the most powerful tool to change the world,” she said. More photos are available on MCCC's Facebook page here. From left, student speakers Qayshawn Williams, Omayra Vargas and Eddy Savaria. Not pictured: Nicholas Castro and Bobbie Wallace. Foundation Executive Director Ed Gwazda. 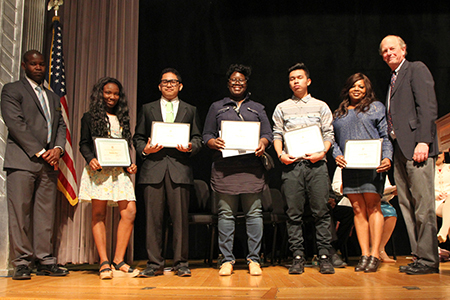 far right, and Vice President for Finance and Administration Mark Harris presented scholarships to five students. (A total of 25 Foundation scholarships were awarded.) Scholarship recipients pictured, from left, are Ezekieline Esau, Luis Garcia, Tericea Hatcher, Jason DeLeon, and Latasha White. 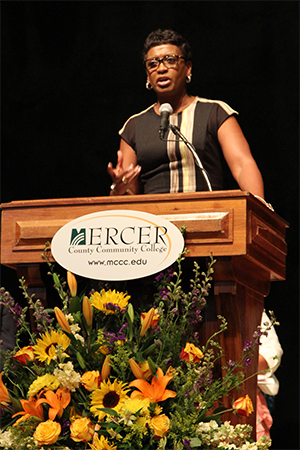 Guest speaker Susan Powell encouraged students to "dream big, stay hopeful and believe in yourself." 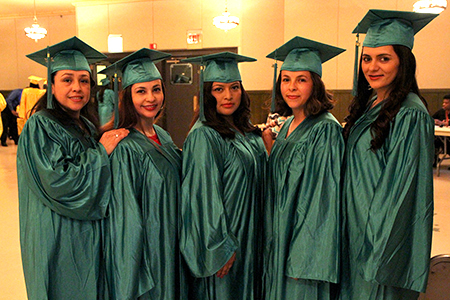 ESL grads ready to move on to the next chapter. Employees had their moment in the spotlight. Financial Aid Officer Edward Mooney, pictured with JKC Provost Monica, was selected for an award, along with faculty member Melissa Santiago and Youth College's Wayne Murray.